The other night on the Beverley Hills list serv, someone wrote and asked how to get rid of slugs – you know, those pesky, slimy creatures that love to eat holes in anything with a broad green leaf. Our backyard is full of hostas and we learned early on to take preventive measures. Slugs invade the garden when seedlings or new growth are the most vulnerable. Slugs are hermaphrodites: they all have male and female reproductive systems and can mate with themselves. Yuck! They can stretch to 20 times their normal length to get at food. Slug eggs are in the soil just about everywhere. It takes moisture to allow them to hatch. 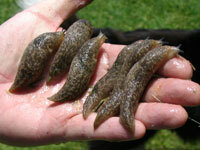 There are at least 40 varieties of slugs. Slugs generally steer clear of: Artemisias, daylilies, Fresia, Lemon balm, Red cabbage, alyssum, Azaleas, Daffodils, Grapes, Mint, Lungwort, Rosemary, Red oak leaf lettuce, Basil, Evergreens, Corn, Fennel, Cosmos, Chard, Foxglove, Hibiscus, Ivy Swedish in particular, parsley, sages, tansy, pumpkin, sunflowers, chicory and endive. Some predators of slugs include: ground beetles, particularly carabid beetles, turtles, toads, frogs, lizards, rove beetles, salamanders, lightening bug larvae, garter snakes, and especially most birds. The appeal factor to all these creatures is the fact that slugs are pure protein. Yummy.